Facebook said it would conduct staff-level briefings of six committees Tuesday and Wednesday. That includes meetings with the House and Senate Judiciary Committees, as well as the commerce and intelligence committees of both chambers. The U.S. Federal Trade Commission is also probing whether Facebook violated terms of a 2011 consent decree over its handling of personal user data that was transferred to Cambridge Analytica without users’ knowledge, according to a person familiar with the matter. The FTC will be sending a letter to the company, another person said. 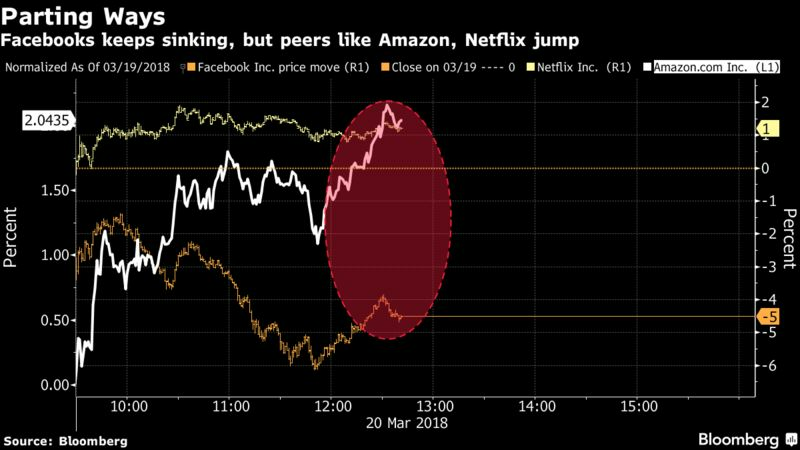 Facebook slumped on the news, extending Monday’s decline. The FTC is the lead U.S. agency for enforcing companies’ adherence to their own privacy policies and could fine the company into the millions of dollars if it finds Facebook violated a 2011 consent decree. New York State Attorney General Eric Schneiderman announced on Tuesday that he and Massachusetts Attorney General Maura Healey had sent a demand letter to Facebook as part of a joint probe stemming from the fallout. Connecticut Attorney General George Jepsen announced his own probe Monday. Amid the scrutiny, Facebook will be confronting immediate demands by Congress. In addition to the briefings, Senator Mark Warner of Virginia, the top Democrat on the Senate Intelligence Committee, said he wants to hear testimony from Facebook Chief Executive Officer Mark Zuckerberg, as well as Twitter Inc. CEO Jack Dorsey. Senator Richard Burr of North Carolina, chairman of the Intelligence Committee, said any decision about calling Zuckerberg to appear before the panel is farther off. Republican Senator Susan Collins of Maine, who also serves on the Senate Intelligence Committee, said Tuesday that she has "grown increasingly concerned as we’re learning more and more about the manipulation of data, the harvesting of data from Facebook, the ads that were placed to sow the seeds of discord in this country." The panel has previously heard testimony into Russia’s use of Facebook to attempt to meddle in the 2016 election. "I believe that Facebook, Twitter, the other social media platforms have a lot of questions to answer," she said. Cambridge Analytica’s board announced Tuesday it was suspending CEO Alexander Nix pending an independent investigation into his comments in an undercover video by London’s Channel 4 News. Nix told the reporters, who posed as potential clients, that the firm’s services included the potential to try to induce targets with bribes, entrapment by prostitutes and spreading disinformation. In an earlier statement, Cambridge Analytica said it “strongly” denied “false allegations” in the media and said that the Facebook data at the center of the scandal wasn’t used as part of services provided to the Trump campaign. Under the terms of the 2011 settlement with the FTC, Facebook agreed to get user consent for certain changes to privacy settings as part of its resolution of federal charges that it deceived consumers and forced them to share more personal information than they intended. That complaint arose after the company changed some user settings without notifying its customers, according to an FTC statement at the time. "The FTC takes the allegations that the data of millions of people were used without proper authorization very seriously," FTC Commissioner Terrell McSweeny, a Democrat, said in a statement Tuesday. "The allegations also highlight the limited rights Americans have to their data. Consumers need stronger protections for the digital age such as comprehensive data security and privacy laws, transparency and accountability for data brokers, and rights to and control over their data." Earlier, an FTC spokeswoman said that the agency can’t comment on whether it’s investigating but said that it takes "any allegations of violations of our consent decrees very seriously." The people who described the FTC’s moves asked not to be identified because the details aren’t public. Facebook previously said in a statement it rejects "any suggestion of violation of the consent decree." Facebook fell 2.6 percent to $168.15 in New York, the lowest level since September. That follows a drop of 6.8 percent Monday that was the company’s largest since March 2014. Despite the outcry by lawmakers, GOP-controlled congressional committees haven’t demanded formal hearings with Facebook executives. Senator John Thune of South Dakota, chairman of the Senate Commerce Committee, said a decision on public hearings would be made after the Facebook briefings this week. A key question will be appetite by the committees, several of which have already interviewed top Facebook executives, for a public appearance by the company’s leadership, including Zuckerberg. The founder has remained essentially invisible in recent days, even within Facebook. Senators Amy Klobuchar, a Minnesota Democrat, and John Kennedy, a Louisiana Republican, repeated their bipartisan call Monday for testimony by the CEOs of Facebook, Twitter and Alphabet Inc.’s Google before the Judiciary Committee. The Facebook officials currently set to brief members of Congress include the company’s deputy general counsel and deputy chief privacy officer, said a congressional official. Senator Dianne Feinstein, the top Democrat on the Senate Judiciary Committee, said in a statement that that it would "be helpful for Facebook to testify about how the company protects user privacy and what steps it’s taking to combat bad actors." "We have a lot of questions about how this information was used, whether it was given to Russia and whether Cambridge Analytica and the Trump campaign communicated with WikiLeaks," Feinstein added. Cambridge Analytica’s chief executive officer faced questions during a meeting with the House Intelligence Committee in December about whether he sought material from WikiLeaks publisher Julian Assange that was stolen from computers of the Democratic National Committee and from John Podesta, who chaired Democrat Hillary Clinton’s 2016 presidential campaign. In a letter Tuesday to House Judiciary Committee Chairman Bob Goodlatte of Virginia, top House Judiciary Committee Democrat Jerrold Nadler of New York said that neither Nix nor Brad Parscale, who ran the 2016 Trump campaign’s digital operations and hired Cambridge Analytica as a consultant, have responded to Democratic requests for information. Parscale has since been named the manager of Trump’s 2020 reelection campaign. Democrats on the House intelligence panel led by Adam Schiff of California say they will continue their work. Schiff on Tuesday said a Cambridge Analytica whistleblower, Christopher Wiley, has agreed to be interviewed by them. The Facebook revelations have also prompted transatlantic reaction. The chairman of a UK parliamentary committee announced Tuesday he was requesting that Facebook’s Zuckerberg, who has remained silent for days, appear before the panel to supplement prior testimony by the company’s executives. White House spokesman Raj Shah said Tuesday that Trump “believes that Americans’ privacy should be protected” and supports federal investigations into the incident. “If Congress wants to look into the matter or other agencies want to look into the matter, we welcome that," Shah said on Fox News. Asked if Zuckerberg should testify, Shah demurred. "Without knowing the specifics, it’s difficult to talk about whether an individual should testify,” he said. On Tuesday, a Facebook executive answered questions from employees on the issues during internal town hall meeting at the company’s Menlo Park, California, headquarters.